Think of cytokines as messengers carrying a chemical message surrounded by protein molecules. Depending on which cells they interact with, or the type of cytokine, the outcome of that message varies. Cytokines exist in virtually every biological response, prompting cells to replicate, develop, or fight disease; however, they can also cause cells to stop functioning. Given the diversity of cytokines, it is possible to categorise them into several major groups: interferons, tumour necrosis factors, and growth factors. These types of cytokines all sit under the umbrella of “proinflammatory cytokine”. Proinflammatory cytokines promote an inflammatory response in cells, whereas anti-inflammatory cytokines (interleukins) do the opposite. 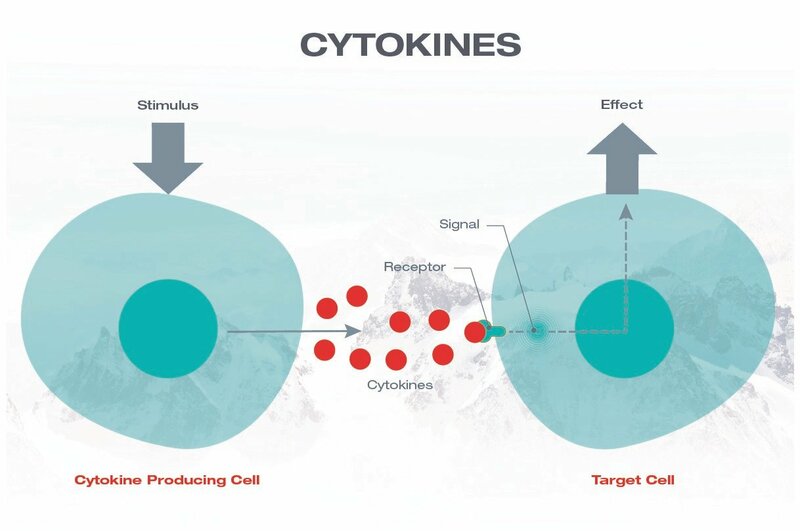 The power of cytokines lies in our ability to manipulate or stimulate their production to achieve a specific biological response. Understanding how cytokines operate, when they are produced, and more importantly, what biological response they trigger is revolutionising treatments in modern medicine. Damaging proinflammatory cytokines are linked to the development of autoimmune diseases like rheumatoid arthritis, coronary artery disease, and periodontal disease. Moreover, research has shown the potential for these autoimmune diseases to further develop into cancerous growths. Equally as important is the link between cancer and proinflammatory cytokines. There is a firm belief that therapeutic treatments can be used to block or inhibit the production of proinflammatory cytokines to assist in treating certain types of cancer. Cytokines are showing the potential to be a big deal in how we treat debilitating or fatal diseases. Getting the balance of cytokines is pivotal not only in combating autoimmune diseases, but maintaining a healthy human body. That balance comes to light when you consider that while proinflammatory cytokines are linked to cancer, anti-inflammatory cytokines are introduced in large doses as part of cancer immunotherapy. By synthesising them in a lab, it is possible to add more interleukin (anti-inflammatory) cytokines than our bodies would typically produce. Interleukin 2 (IL-2) stimulates the production of antibodies, while a similar cytokine, interferon-alpha (IFN-alpha), helps regenerate immune cells that have stopped functioning. Fortunately, many of us naturally promote a healthy balance of cytokines just through our choice of diet. Individuals on a gluten-free diet will benefit from a better balance of cytokines, as gluten may have links to promoting an inflammatory response. Additionally, superfoods can encourage the production of anti-inflammatory cytokines, making them a valuable complement to our diet. While our food choice helps promote beneficial cytokines, stress can trigger our nervous system to block the vital functions of anti-inflammatory cytokines. Proper stress management is integral to ensure natural, healthy production of cytokines and to improve our overall health.